Have a business or nonprofit idea? Or maybe you have technical skills and want to work with others on their idea. Join us for this informal networking event where students with entrepreneurial interests can connect with one another. We will have a short ‘How to Pitch’ presentation for those interested in competing in Thursday’s Elevator Pitch Competition with a cash purse of $1,000! 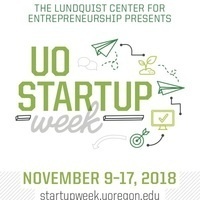 This event is part of UO Startup Week and is sponsored by the UO Innovation and Entrepreneurship Club.